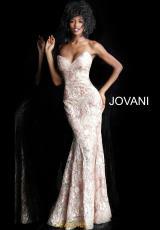 Be the center of attention in this lovely prom dress 67331 by Jovani at any special occasion. This elegant style showcases a strapless sweetheart neckline which goes into a simple zippered up back. Featuring a slim fitting silhouette made in a stunning sequined material which flaunts elegant appliques all throughout.